For thirty years, Fr. John-Julian has practiced contemplative prayer daily as a monk of the Order of Julian of Norwich. The book is a record of letters of advice written to a young seminarian who was interested in investigating the practical dimensions of the contemplative way for himself, full of questions: "What is all this contemplative prayer people are talking about these days? I never heard anything about that back in my parish. Is this really part of the Christian tradition or some New Age import from Buddhism or some other -ism?" 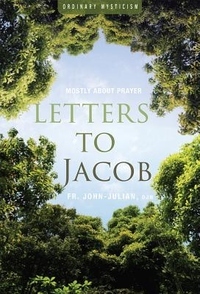 The answering letters have been edited, re-written, expanded, and polished into Letters to Jacob: Mostly About Contemplative Prayer (with a nod to C.S. Lewis)--a rare look at the contemplative life from the inside, with a series of cautions and warnings based on the realities of the contemplative way, not some intellectual concept. It faces into the unpopular but essential dynamics that few others have dared to present, with all the masks removed. There are a few theological side trips as well, exploring subjects like the nature of God, sin and repentance, salvation, good liturgy, the keeping of rules, and the spiritual value of bad posture.